Post Raises Questions for American Pharoah in 2015 Preakness: Post positions came out for the Preakness Stakes GI on Saturday and American Pharoah supporters received some possibly bad news when the Kentucky Derby champion drew the rail slot. The horse directly outside is Dortmund, his stablemate who recovered from a minor case of colic to finish third in the Derby. Meanwhile, Firing Line gets to break from the outside, which raises questions too. Clearly, the connections and jockeys will need to think about the break and how they want to handle different scenarios. American Pharoah is still the one to dethrone, but he is not invincible. If successful in the Preakness, American Pharoah would take one step closer to a Triple Crown. 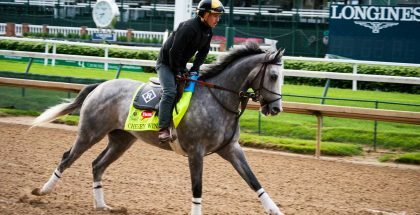 Horses must win the Kentucky Derby, Preakness and Belmont Stakes to accomplish this feat. As noted in an earlier article, trainer Bob Baffert never lost the Preakness with any of his Derby winners. Common handicapping logic dictates that when a horse draws the rail, the rider is obligated to use the horse in order to gain position. In some cases, they shoot for the lead from the start. For American Pharoah, the fact that Dortmund is directly to his outside poses a problem. Yes, Dortmund can rate. He showed this more than once. But, Dortmund has not rated in a few starts and if he shows his natural speed, that might place American Pharoah in a position where Dortmund hounds him on his flank for the first portion. If jockey Victor Espinoza tries to rate American Pharoah rather than shoot for the lead, Dortmund and Mr. Z from the third slot can trap the Derby hero in a box. American Pharoah rated in his past two starts while running in the clear. Analyzing Dortmund’s case in general is a head scratcher. Formerly undefeated, the Big Brown colt finished third in the Derby after setting the pace and tiring in the latter stages. A few months before, Dortmund seemed to tire on the far turn of the GIII Robert B. Lewis at Santa Anita against Firing Line, then came back towards the end to win. In the Derby, he lacked the same determination. 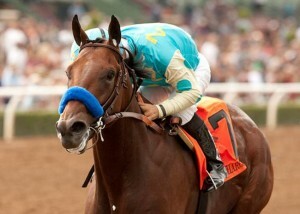 Baffert revealed Dortmund was ill in the days leading up to the Derby. The question for handicappers is whether the illness affected Dortmund’s effort, or were American Pharoah and Firing Line simply better? Firing Line drew the outside number eight post, and he must clear some horses to secure position before the first turn. Divining Rod, a horse with a dangerous amount of speed, breaks to his inside. If Divining Rod’s rider Javier Castellano wants to, he could try to float Firing Line wide for a few moments before crossing over Bodhisattva. Interestingly enough, Bodhisattva has speed too and can play dirty by blocking those two. On a separate note, Mr. Z’s presence is a surprise because owner Mr. Zayat repeatedly told followers on Twitter that Mr. Z is not running. Legendary trainer D. Wayne Lukas lobbied hard though for this colt to take a shot. 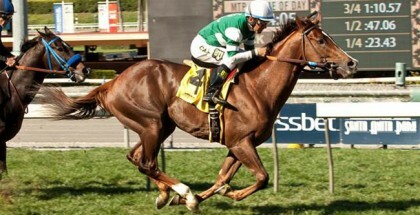 In a strange twist afterwards, Zayat reportedly sold him to Calumet Farm. Back in December when Mr. Z ran well against Dortmund and Firing Line at Los Alamitos, he appeared on the same level as those two. Since then, Mr. Z went in the opposite direction and can only hope to hit the board in this spot. American Pharoah remains the most talented horse and they will need to run their best to defeat him. At the same time, the above factors must be considered before taking out the kids’ college funds. 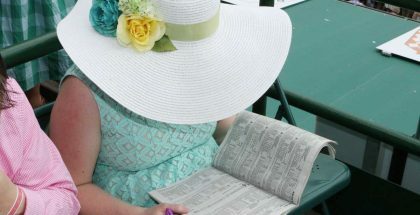 In fact, this may strike some bettors as a poor betting race overall, with the three expected favorites being the three actual best horses entered. American Pharoah, Dortmund and Firing Line are obvious contenders. If wanting a creative play, then try a backwheel with Danzig Moon underneath and those three on top in a trifecta. Otherwise, just enjoy the race. The 2015 Preakness Stakes is the thirteenth race is the day with a 6:18 pm ET post time and will air on NBC on Saturday.